Gamers rejoice as the month of March will host Malaysia’s biggest Esports’ events with a prize pool of RM150,000; one of the biggest in Malaysia yet. 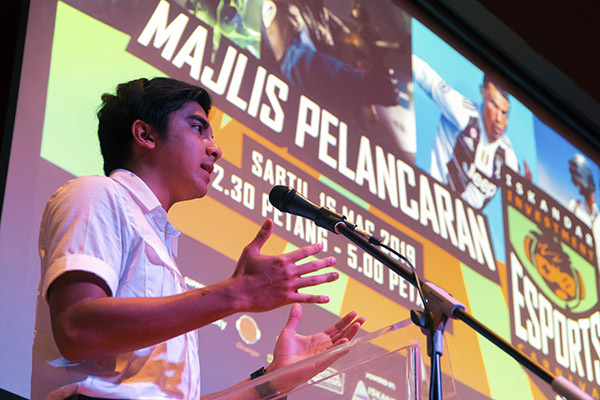 Officiated by Minister for Youth and Sports Syed Saddiq, the pre-launch event was held at the Auditorium of CIMB Leadership Academy in Medini, Iskandar Malaysia. “The ministry is confident that Esports is here to stay and we are ecstatic to learn that six medals have been allocated for Esports in the upcoming SEA Games in Manila, Philippines. The presence of the Esports ecosystem in Johor is quite conducive with companies such as Iskandar Investment Berhad (IIB) being at the forefront of this movement, and the Academy of Esports generating batch after batch of professional Esports athletes. I hope more corporate companies throughout the nation will come forward and collaborate with the ministry so that Malaysia can become ASEAN’s Esports hub very soon,” said Syed Saddiq. The main event, being held on the 30-31st of March 2019 at the indoor Arena in Educity, Iskandar Puteri will see over 100 teams battle it out for a piece of the prize pool of RM150,000. Expected to draw a crowd of 3000 participants, the event will see 4 main games being played out across both days, Dota 2, CS:GO, Fifa 2019 and PUBG mobile. The event will also host boot camps for certain games for those interested to have a better understanding in what it takes to be a professional Esports athlete. The event is being organised by the Academy of eSports (AOES), Malaysia’s first Esports academy located right here in Johor.